The coolest thing happening now in eyeglass optics is digital lens technology, also called “free form” or “high-definition”. As with many new technologies, there is much confusion among consumers about what exactly digital lenses are. That’s because there is much confusion even among opticians about what exactly digital lenses are. The voluminous amount of information online about digital lens technology is either oversimplified and incorrect, or accurate but challengingly technical. I’m going to try to bridge the gap with a clear technically accurate explanation that is accessible to everyone, and will hopefully demystify the technology and illustrate when it is valuable and when it is not. The most primary benefit of digital lenses is that they are custom made exactly to each Rx, and do not suffer the compromises endemic to conventional lens manufacturing. 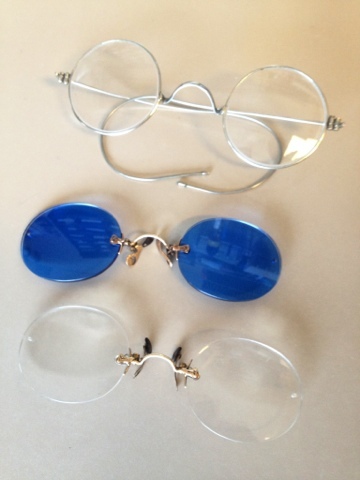 Conventional lenses are partially premade by lens manufacturers, and when Rx lenses are produced a lab selects from among the premade materials whichever is most appropriate for the Rx and then grinds the prescription as closely as possible into the material. However, every unique Rx requires a completely unique curvature of the lens for best correction. When premaking materials, manufacturers cannot economically produce every curvature for every Rx, so they produce a dramatically reduced selection of curvatures that are satisfactory for most Rxs. But satisfactory is far from perfect. Some of the optical distortions and aberrations one experiences with conventional lenses, such as the “fish bowl” effect and blurry vision at the peripheral edges of the lenses, are because the curvatures are just not perfectly matched to the Rx. For example, your particular Rx may require a 3.25 curvature for best correction. However, the manufacturer may only produce lens materials in 2.00 and 4.00 curvatures, so the lab must select from those. They would round up and use the 4.00, but this rounding constraint guarantees optical error in the lens fabrication even before it has begun. It’s close, but not right. Digital lenses are produced by a digital lens fabrication process that eliminates the constraints of premade materials. 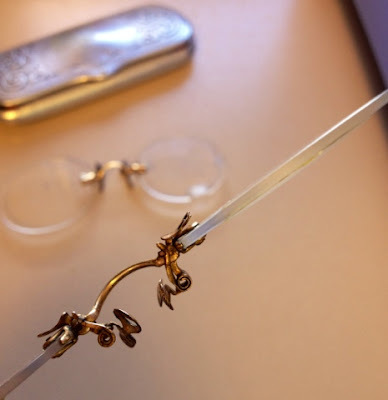 The advanced machines employed in the process cut custom curvatures to exacting specifications as low as 0.01 diopters, and can produce the aforementioned 3.25 curvature, or any other that is called for, with extraordinary accuracy. 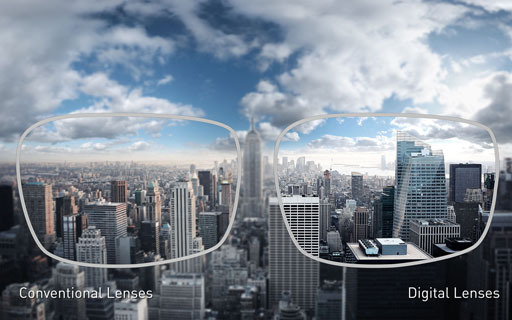 This enhances visual comfort by eliminating the distortions of merely “close” curvatures, as well as preserves optical clarity in all parts of the lens providing clearer peripheral vision than conventional lenses. The benefits of digital processing are compounded when astigmatism is involved. To correct astigmatism lenses have two prescriptions ground into them at cross directions. Since every unique Rx requires a unique curve, lenses that correct astigmatism require two unique curves. Conventional lenses that correct astigmatism are still made from the single premade curve selection, so they will err due to rounding in both directions. 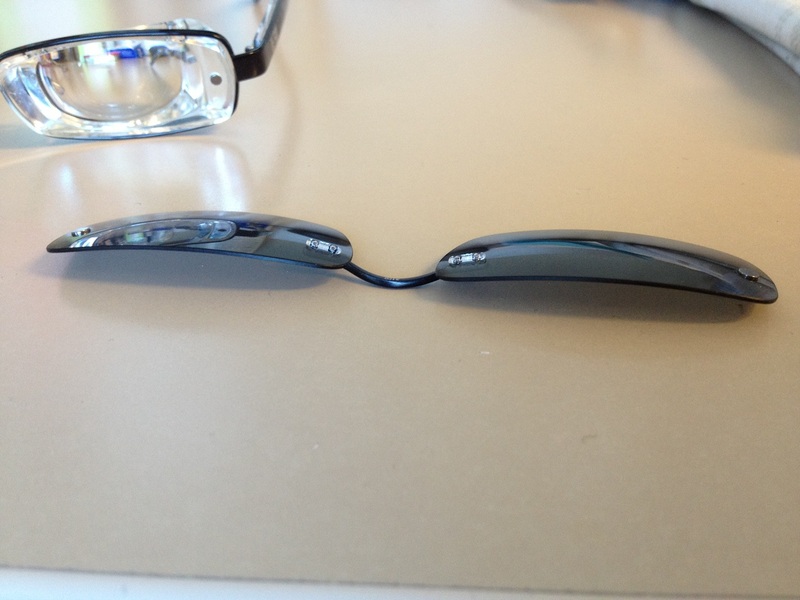 If the astigmatism is high, it becomes impossible to even come close to proper curvature for both prescriptions with a single premade curve, and wearers end up with lots of distortion and peripheral blur. Digital technology enables perfectly accurate curves for both prescriptions to be fabricated in the lenses, providing high astigmatism patients better vision than possible in conventional lenses. This custom precision curvature, often called "optimized" as in the curves are optimal for any given Rx, is the simplest level of digital customization. Examples of this technology in single vision and progressive are the Essilor 360 and Varilux DRx line, Shamir Spectrum, and Zeiss Choice Series. The Rx of a lens depends on the curves cut into the lens, but also depends on the distance of the lens from the eye as well as the tilt and angle of the lens relative to the eye. 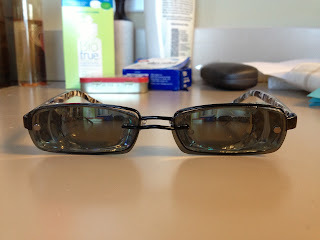 The Rx from the doctor assumes a final spectacle lens that sits at the same distance from and angle of tilt relative to the eye as the lens in the exam room. The reality is that there exists a huge variety of frame shapes, angles, and sizes, of which virtually zero replicate the exam room lens position. Therefore, a lens conventionally fabricated to the Rx as written and put into a frame will not exactly reproduce the vision experienced in the exam room. Even the digitally curvature optimized lenses I just talked about only perfectly replicate the doctor's Rx if the lenses are held in exactly the same position in front of the eye as the doctor's exam room lens was. This is where digital technology gets really cool. Since this fabrication method frees lens makers from the constraints of prefab materials, and the extremely prescise machines can cut just about any unique surface we can imagine, we can customize the lens in ways never before possible. We can measure the distance from, and angles relative to, the eye that a particular frame holds the lens on a particular patient to gather “position of wear” information. Every combination of frame, face, and Rx produces a completely unique set of parameters, and once the data is gathered a uniquely personalized lens is computer modeled to take all those factors into account, and then precision machines individually custom fabricate lenses to those exact specifications. The result is a lens perfectly designed for that patient's Rx, in a particular frame, fit to that patient's particular face, which exactly replicates the doctor's exam room Rx. 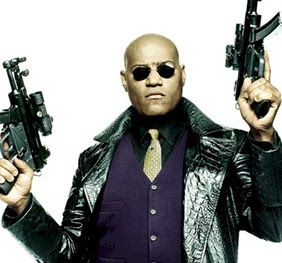 Anything short of this level of customization will not perfectly recreate the exam room vision. Examples of these fully customized digital lenses are the Essilor Fit Single Vision and Varilux Physio Enhanced Fit, Shamir Autograph, and Zeiss Individual. 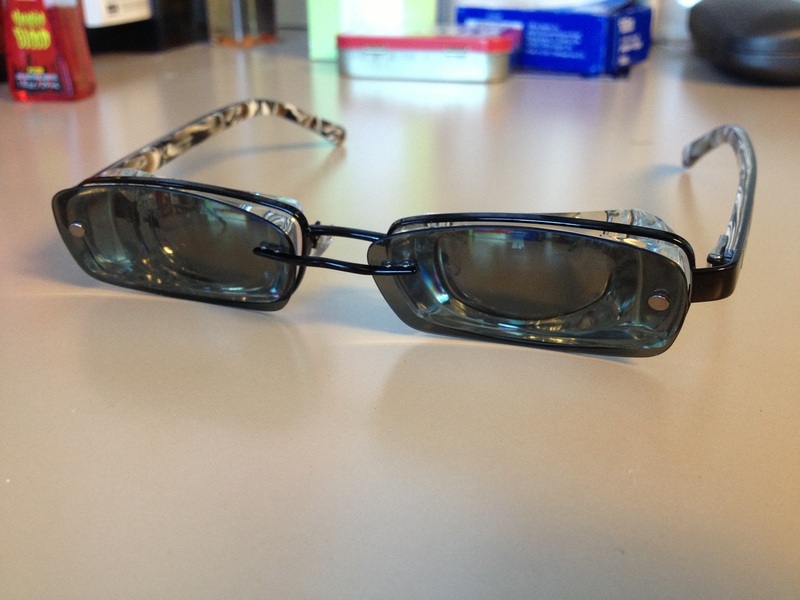 Anyone can wear digital lenses, but some will get more benefit than others, and some will perceive no difference. Patients with mild Rxs, in frames that are fit at a proper distance from the eye and have moderate tilt and wrap, will experience little advantage from the digital technology explained here. As Rxs increase in power, in complexity with astigmatism, and frames deviate from “classic” fitting parameters, conventional lenses will have more error and digital technology becomes more beneficial. Personally, I evaluate every patient individually on their Rx, the frame they select, and how that frame fits them to determine if they should wear digital or conventional lenses. Conventional lenses do fail to exactly replicate the exam room Rx by a calculable margin, but for some Rxs and patients the degree of error is so low it is below the threshhold of perception, i.e. the perceived difference between the conventionally corrected vision and digitally customized vision is zero. 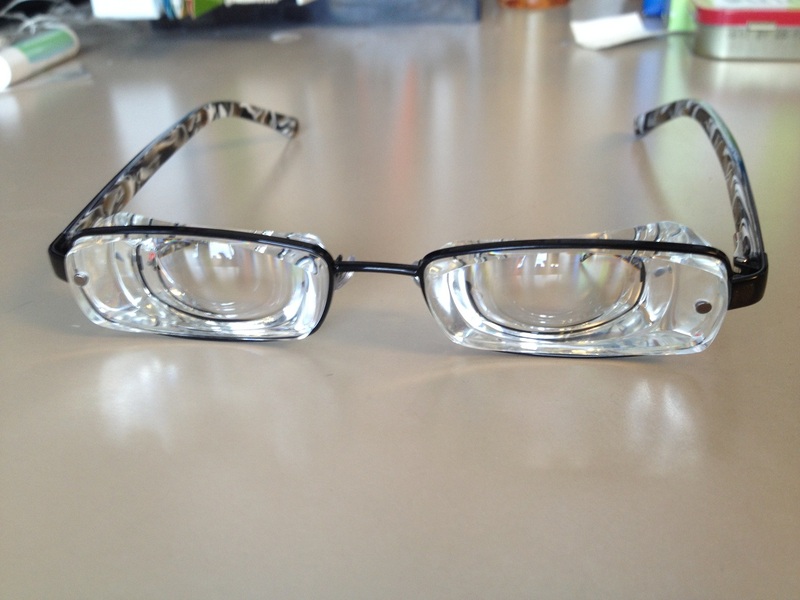 If the perceived difference is zero, the benefit of digital lenses is zero. When the frames deviate far from the classic fit parameters, most typically in highly wrapped sport sunglasses, or when Rxs are strong or have moderate or higher astigmatism, that's when digital lenses shine and can provide crispness and clarity of vision never before possible. 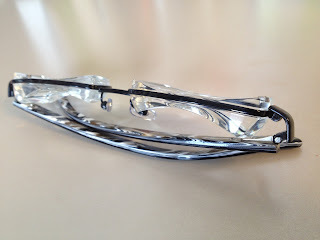 As always, find a good optician to design your eyewear. They will counsel you on the particular benefits of digital lens technology for your needs, and ensure you always get the best vision possible. 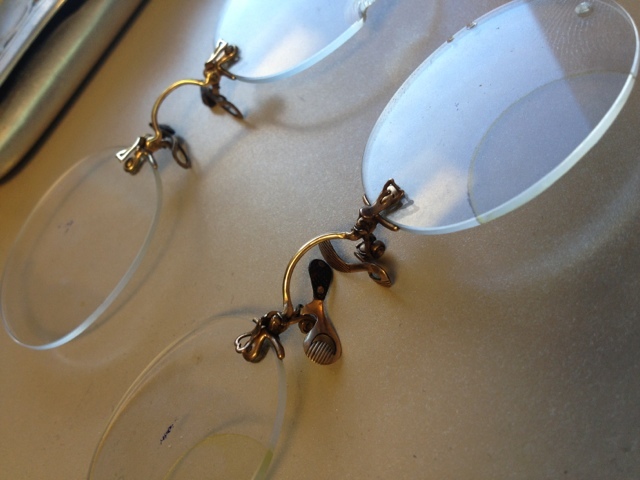 I had the opportunity to make some cool antique spectacles: rimless turn-of-the-century pince-nez style. They were a lot of fun and work with the custom mounting I did. The customer is a fan of vintage and antiques, and plans to use the pince-nez pairs as "hat and tails" attire. 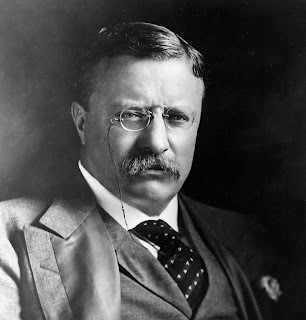 Teddy Roosevelt was an iconic pince-nez wearer. Morpheus revived the coolness of the style. 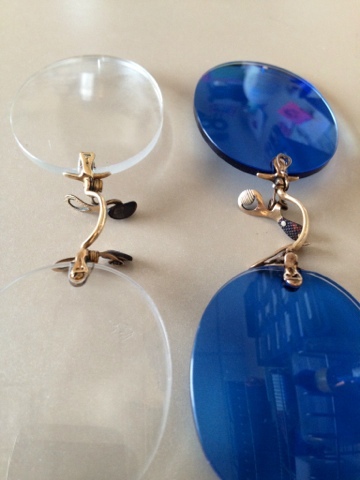 Original 1.5mm thick glass lenses. 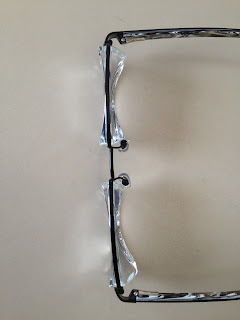 The clamps on either side sit flat against the lens surface, and screw connects the clamps through a hole in the lens to keep it securely in place. 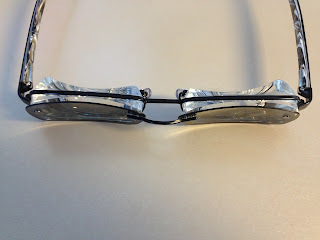 My new polycarbonate lenses were thicker (necessary for proper curvature and better vision) so I cut grooves so the clamps could be recessed into the lens. Notice here the clamps are almost flush with the lens surface, not sitting on top of it. 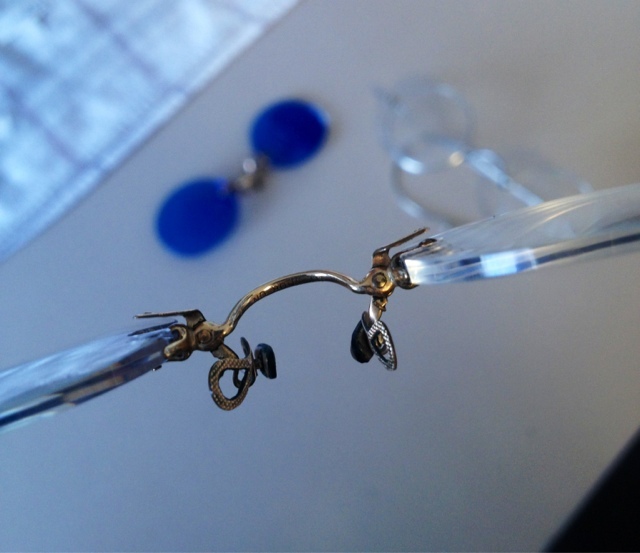 The full metal round pair was a third for the same customer: a nicely patinaed WWII-era antique. 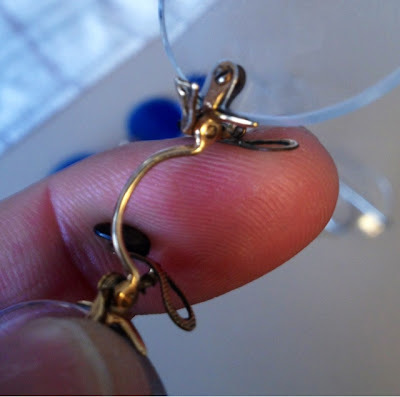 This one was cake compared to the pince-nez. 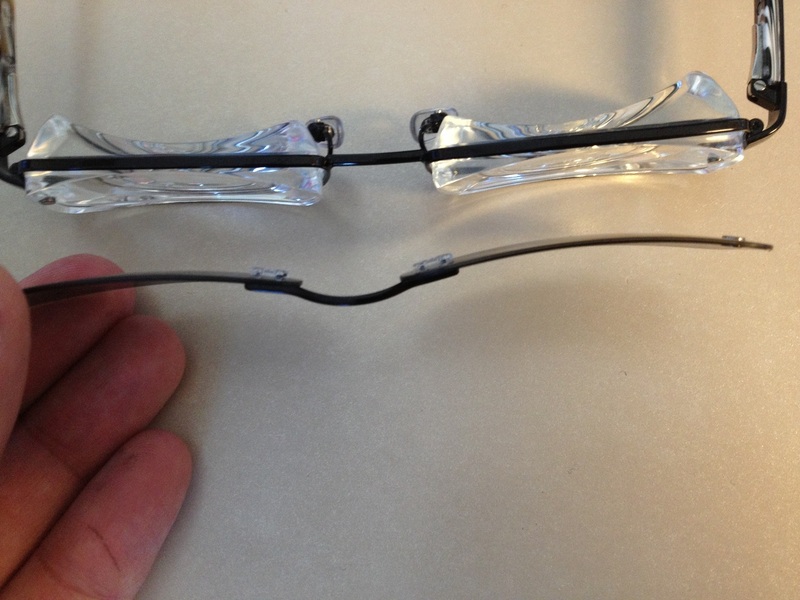 A recent customer of mine had an extremely high power Rx, so strong that to mitigate the thickness on the lens some of the power had to be split onto the front surface, which made the lens bi-concave (concave on both front and back surfaces, instead of the usual concave back and convex front of most lenses). That's all fine and good, I've dealt with such powers and lenses before. 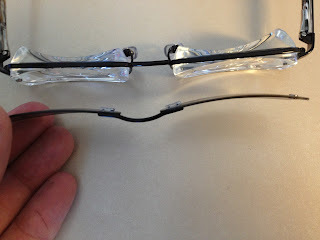 But this customer also wanted the magnetic sunglasses, and the technology certainly wasn't designed with this lens in mind. The basic Chemistrie lens is a simple polarized film laminated between their "Hivex" optical material; the front and back sides are identical, differentiated only by curvature. Since the lens is reversible, I just thought why not turn the lens around to have the convex surface match the concave lens front? 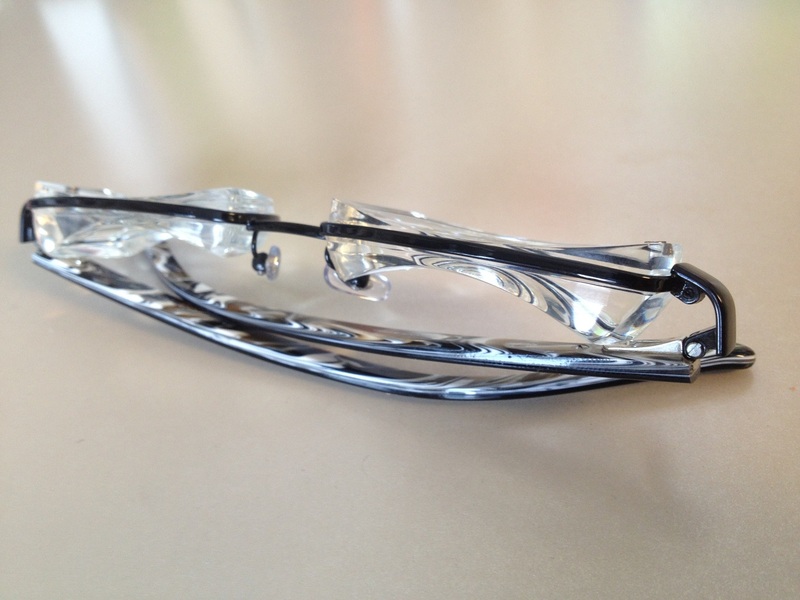 The sunglasses will be the same concave front curve as the Rx lenses. 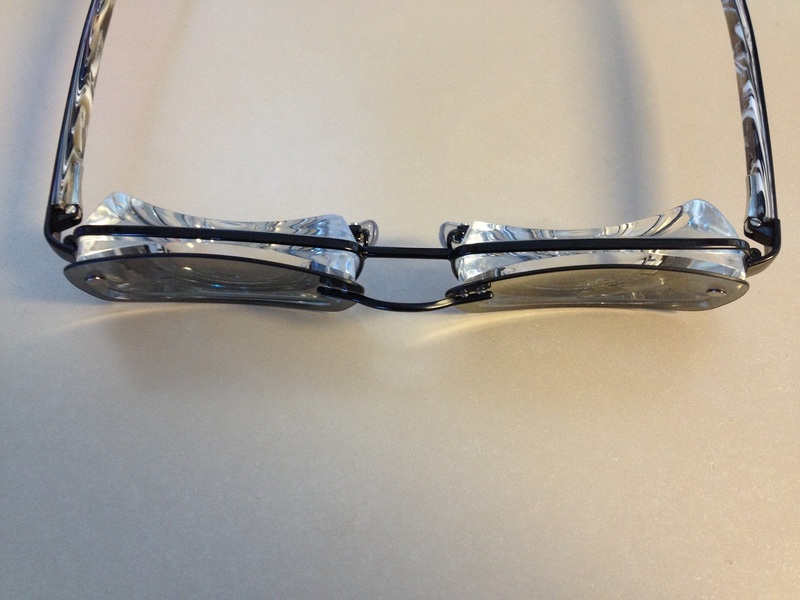 Extremely high power eyewear like this is never elegant, but I think they turned out pretty neat. 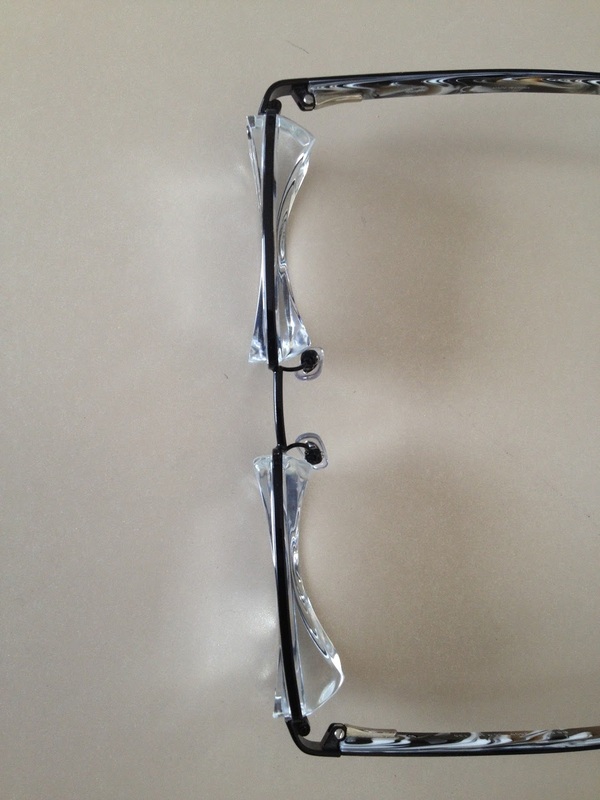 It's cool unique solution that this customer could only get from a few opticians, and I'm glad I was able to do it.